A Japanese company has developed an electrical cable that can be stretched. 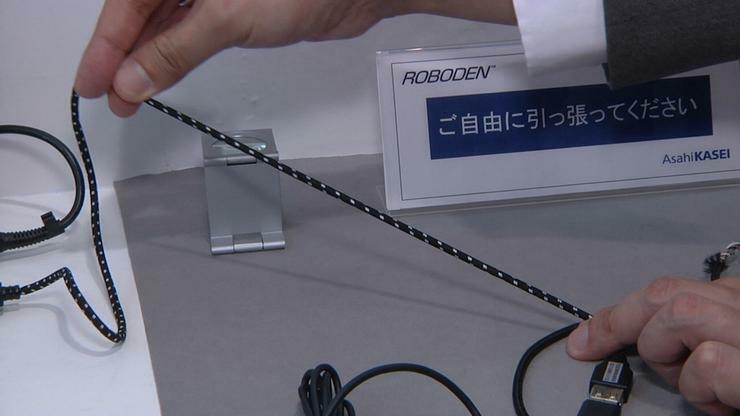 Asahi Kasei says the cable, called Roboden, will expand by up to 40 percent of its length before hitting its limit. It was originally developed for use in robotics, where cables sometimes need to snake around joints that pivot or extend. Typically, spare cable has to be built into the wiring to accommodate this movement, and that can get snagged. Roboden can closely follow the robot’s body and stretch as needed. Asahi Kasei is demonstrating the cable at this week’s Ceatec electronics show in Japan, where it is looking for additional uses for Roboden. It works like this: The inside of the Roboden cable has an elastic core and wire is wound around the core in a spiral. A second stretchy sheath covers the entire thing. The spiralled wire means there is enough inside the cable to allow it to be stetched without incident. One potential use is in gadget cables. Anyone who has pulled a cable by accident and sent a gadget crashing to the floor will attest that current USB cables don’t stretch at all. It could also have a use in portable gadget cabling for devices like power adapters and headphones. No matter how well the cables are coiled on devices, a day inside a backpack always manages to unravel the wire and leave a mess of digital sphaghetti. 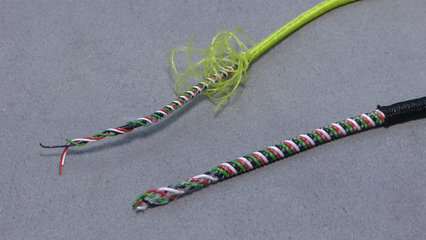 With Roboden, the cable will remain coiled up if a little stretch is put in when winding it tidily.